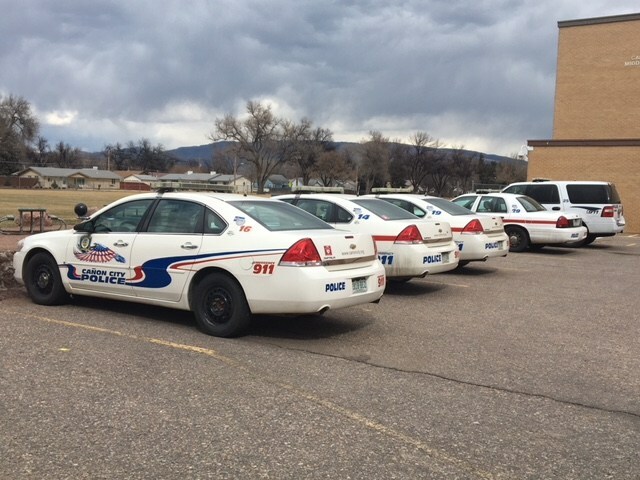 At Cañon City Schools, one of our main safety/security goals is to enhance efforts to not only respond to potential acts of violence but more so to harden our targets and implement preventive measures that can lessen the likelihood of a violent act taking place on a school campus. School Resource Officers are a valuable and necessary addition to enhance the safety and security of our schools. Their role is to support the existing safety and security structure while offering enhanced protection, response, education and counseling of students. To assist our district in the utilization of our SRO’s the following guidelines have been developed in cooperation with the Cañon City Police Department. Provide coordinated grade level appropriate instruction in lessons that promote law related education, to include but not limited to conflict resolution, restorative justice, crime awareness, and crime prevention and safety. Our District Safety Committee (DSC) meets on the 1st Wednesday of each month during the school year. To create a cooperative effort to communicate and promote safety, health and security in our workplace. We will jointly make recommendations for improvements regarding safety and work to detect and correct workplace hazards, reduce injuries, improve and sustain building security and increase overall safety awareness. The DSC is comprised of staff members from all across the district who hold a number of different positions. The diversity of this group is what makes the DSC effective as we continue to enhance and unify our safety and security procedures through out the district. We encourage other staff members to communicate with their buildings DSC member regarding safety and security within their buildings. The Cañon City School Board of Education recognizes that effective learning and teaching takes place in a safe, secure and welcoming environment and that safe schools contribute to improved attendance, increased student achievement and community support. To that end, the Cañon City School District is committed to creating a unified, systematic and consistent approach to provide a safe, welcoming environment for students, staff members, and visitors. All administrators are trained in the National Incident Management System (NIMS) and Incident Command Training using resources provided by the Federal Emergency Management Agency (FEMA). Select individuals serving on the District Safety Committee and Building Safety and Emergency Response Teams have participated in specialized training and the school district offers a variety of ongoing training for students and staff members to prepare them to respond to a variety of emergency situations. We work collaboratively with our community agencies to improve communication and interoperability so that we are well prepared to work together when required in an emergency situation. Additionally, we have established a consistent structure that includes expectations and procedures to assure effectiveness of our district and building level teams. One of the core elements of a successful school safety program is a strong communications system. In Cañon City we were able to combine grant funds and other resources to recently upgrade our radio communication system. Key personnel in every building are now equipped with state of the art radios to enhance their daily communications in their efforts to keep our schools safe and secure. Our radio interoperability with law enforcement also raises our ability to communicate quickly with first responders in the event of an emergency. To support our schools and community in creating a safe, healthy, secure, and positive school climate for Canon City Schools staff and students. To create a safe, healthy and secure environment for our students, staff and the public. To develop a positive safety culture in which members care enough about each other, themselves, students and the community to commit to conducting our day free from injuries and illnesses and public hazards. Create a cooperative effort to communicate and promote safety, health and security in our workplace. We will make recommendations for improvements regarding safety and work jointly to detect and correct workplace hazards, reduce injuries and illness, improve and sustain building security and increase overall safety awareness. According to the legislation, the purpose of the school safety team is to develop, foster, and maintain a positive school climate.